It's almost 2014! Can you believe it?! 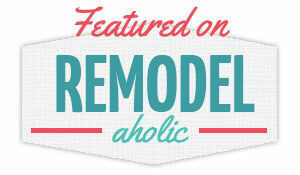 I want to thank you from the bottom of my heart for reading this humble blog and following along on our home renovation journey. Sometimes I wonder if I should continue blogging (life gets busy, and it's definitely hard work), but then one of you will leave a sweet, encouraging comment and I'll remember how nice it is to have an online community of fellow home-lovers. It's always a great reminder of how far we've come when I look back on the year and pick out my favorite blog posts. This year was a big one for us. We became landlords by renting out our first home and bought a new house in a neighboring city. We've been busy with home projects ever since! 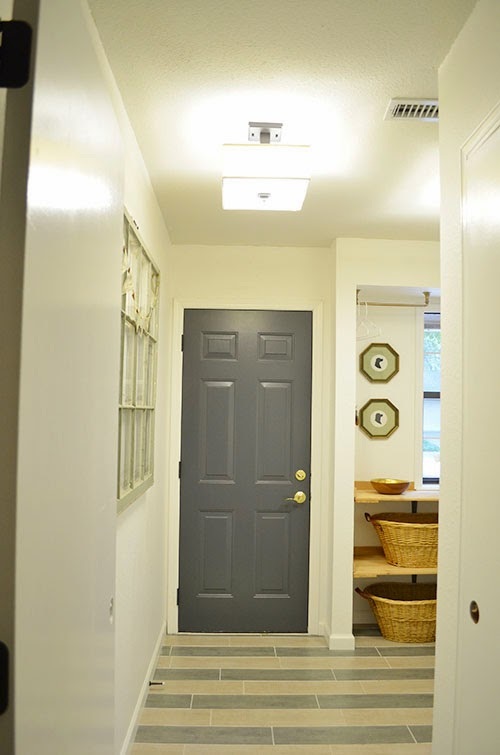 One of my very favorite projects of the year was this simple thrift store light makeover. I found this giant brass entry hall lantern at my local thrift store for $15. A coat of oil-rubbed bronze spray paint later, it's the shining star of the formal dining room in our new house! That lighting project was simple, but this next one was not. 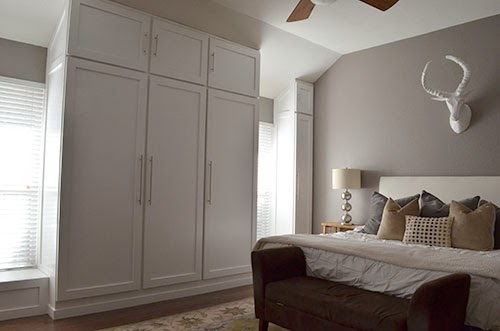 Remember that time my husband became a professional carpenter and created custom built-in closets for us? That's right, you can learn absolutely everything from YouTube! He knocked this one out of the park and taught himself how to do some pretty complicated stuff in the process. And then there was the laundry room makeover. What seemed like a quick and easy weekend project turned into the gift that kept on giving. Despite the fact that I completely underestimated how much work we would have to do in this room, I am completely in love with the finished product. It's a tie between the striped tile and the dog silhouettes for my favorite features. 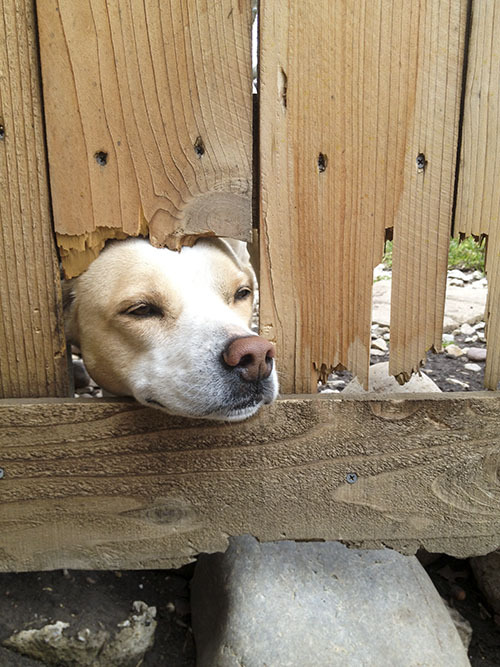 Before we moved from our old house, we completed a simple project that was a long time coming– dog fence windows. I can't believe we waited so long to give them their own puppy peepholes! It felt like a shame to move so quickly after that, but luckily our tenants have a dog who is enjoying watching the neighborhood now. Our den makeover has taken place over several different blog posts during the past few months because was such a big project. 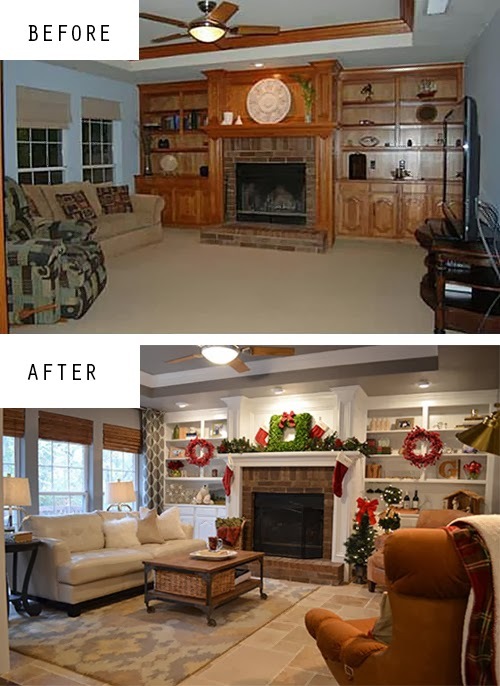 Check out this before and after photo I took after Thanksgiving when we replaced the yucky carpet with tile. Quite a difference, right? It's hard to believe we've already done so much work on this house, but we have plenty left to do. We've got big plans in 2014 for the kitchen, both bathrooms, the backyard... Should be fun! Thanks for hanging with me this year. I appreciate all of your support and encouragement. Here's to more fun in 2014!